There is something quite refreshing about a child who lives in the moment, a child for whom time, as a concept, is rarely used. 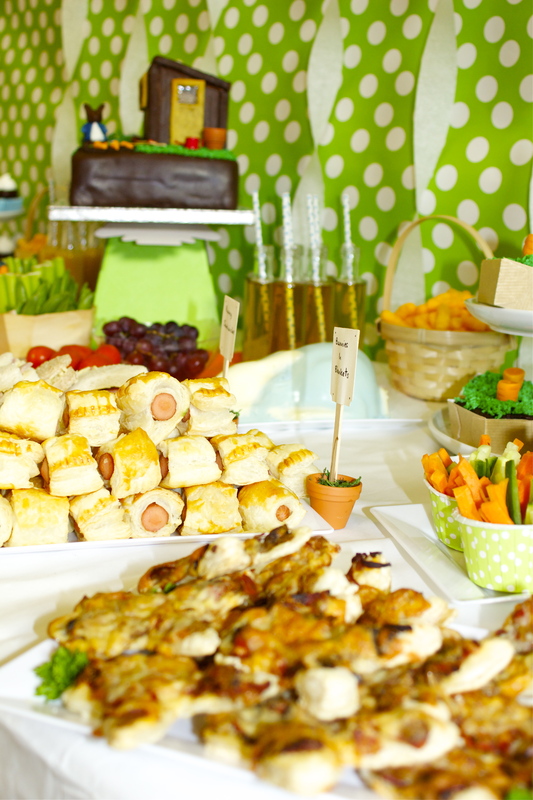 Refreshing that is until you try to usher said child out of the door to avoid the mad dash up to the school gates, or when a major event appears on the horizon..
Lulu was telling everyone she met that her birthday was in January, even before Christmas. Since she went back to school she has asked with increasing frequency “when is my birthday?”, or “is it my party tomorrow?”. 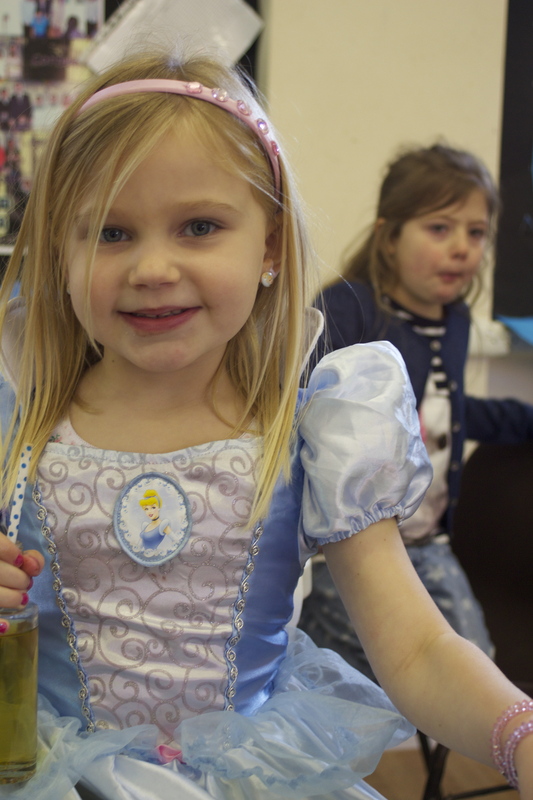 Over the past week, she has witnessed the planning for her party and the creation and steady progress on her birthday cake, and the questions have been coming thick and fast. 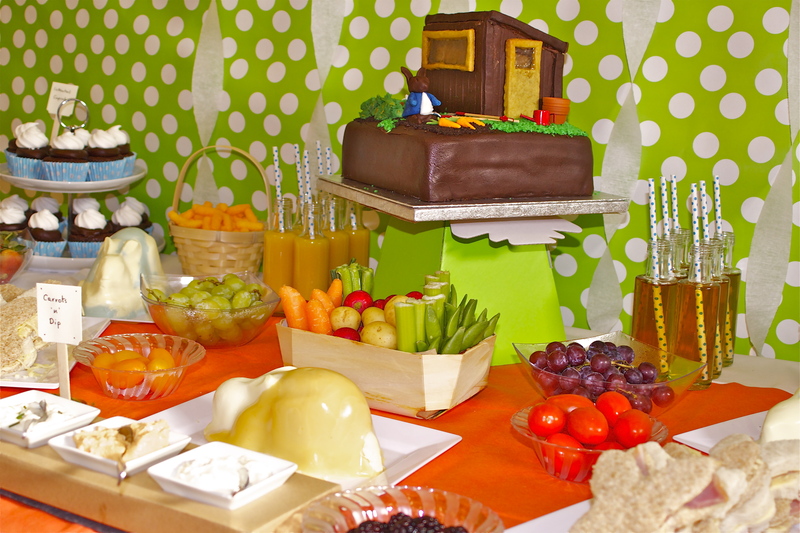 This year Lulu asked for a Peter Rabbit birthday. She came home last Saturday in the midst of my struggles with Peter Rabbit’s ears, which (as previously mentioned) refused to stand upright – a bit of creativity with a couple of cocktail sticks and a safe place to dry and….bingo! Peter Rabbit with appropriately pointy ears. 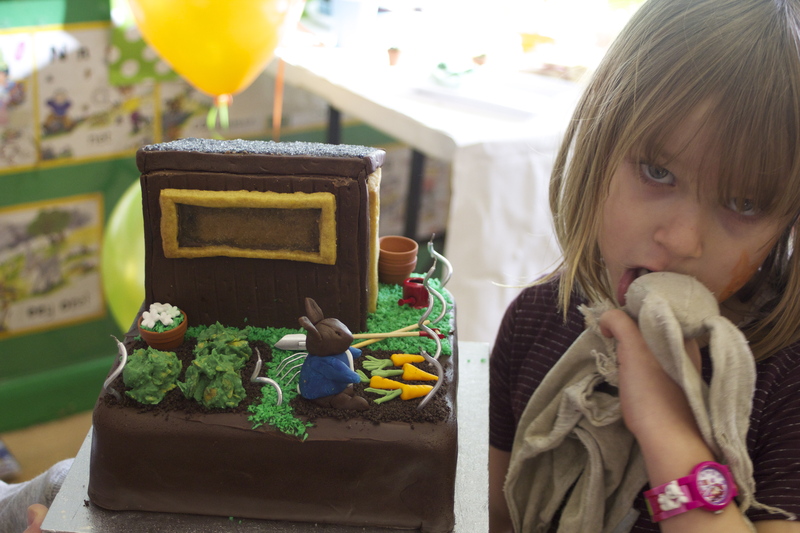 Lulu didn’t see the finished cake until the morning of her party and, despite previously telling me that Peter Rabbit looked only ‘pretty good for a rabbit made of icing’, she was one happy bunny (sorry, couldn’t resist). 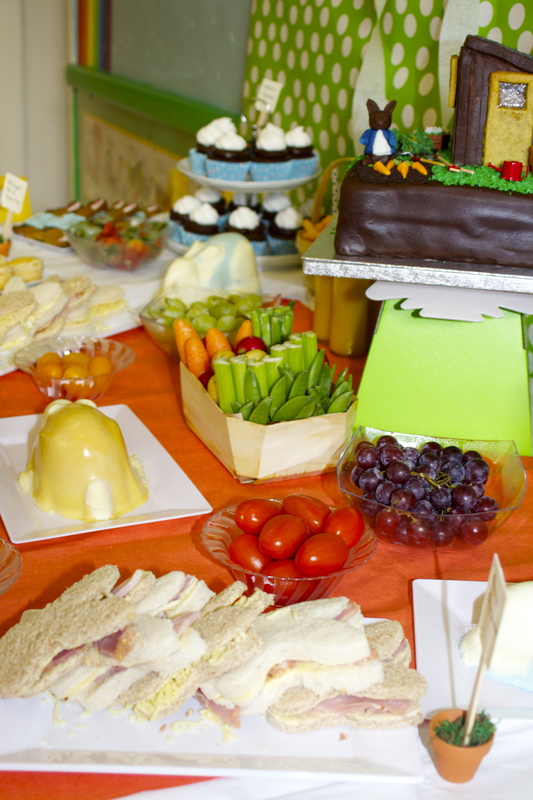 Here is how we did Lulu’s Peter Rabbit Birthday Party. 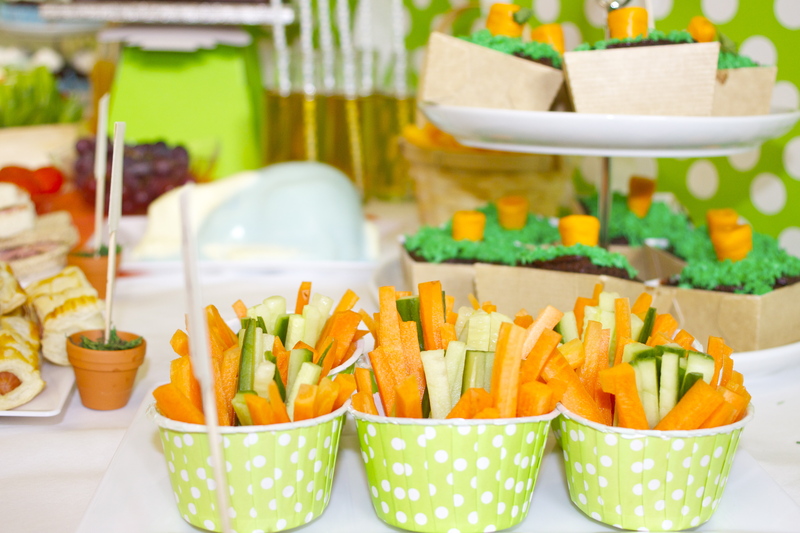 Our colour theme for the Peter Rabbit party was bright green, orange and baby blue. 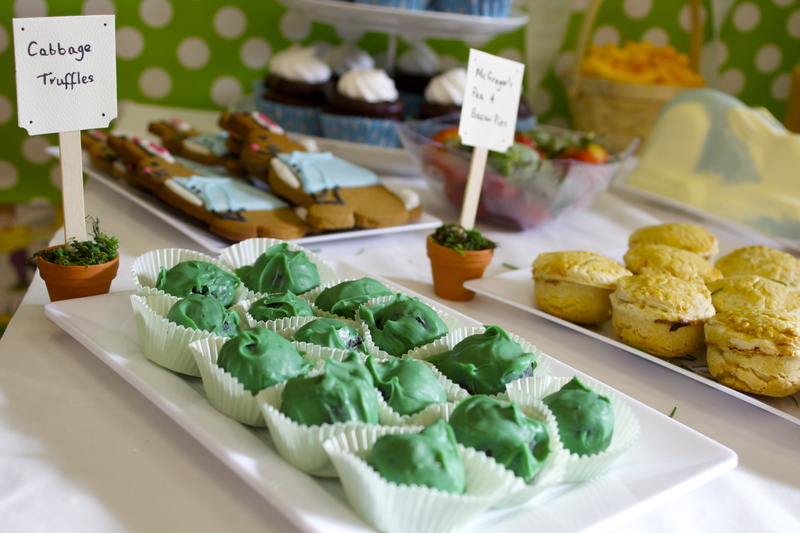 We used a green and white spotty backdrop with white crepe paper flourishes. 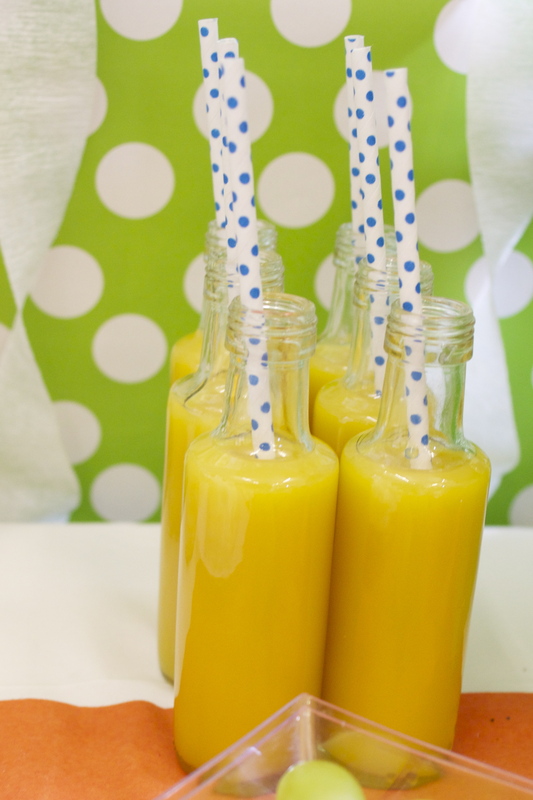 A simple white tablecloth with an orange runner set off the buffet table. 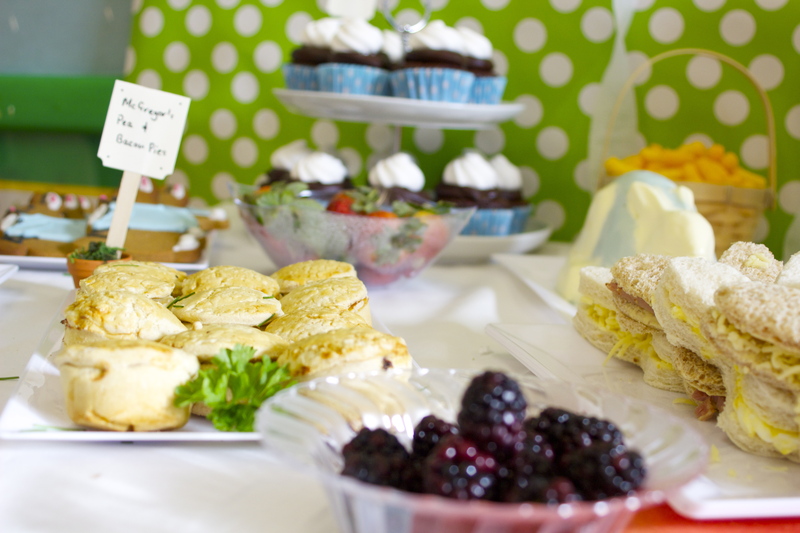 The children’s table was set with a white tablecloth and baby blue plates and cups. 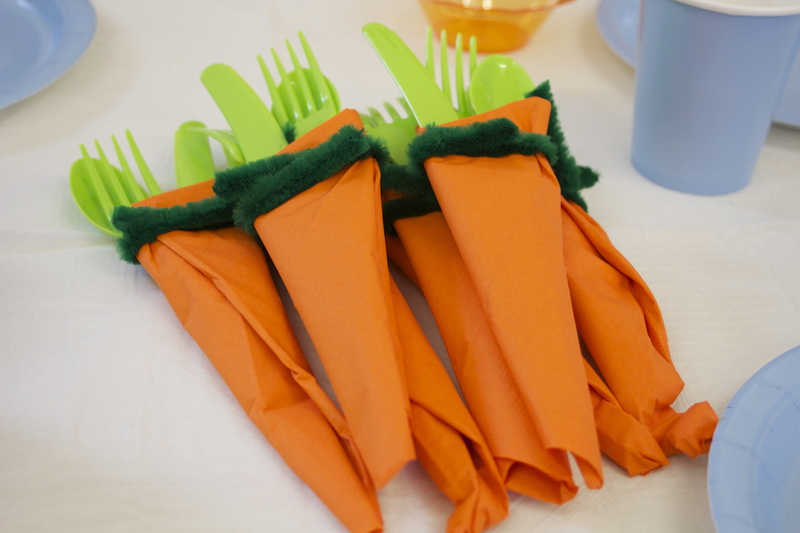 We wrapped the green cutlery in orange napkins to create adorable cutlery carrots – they were a big hit! 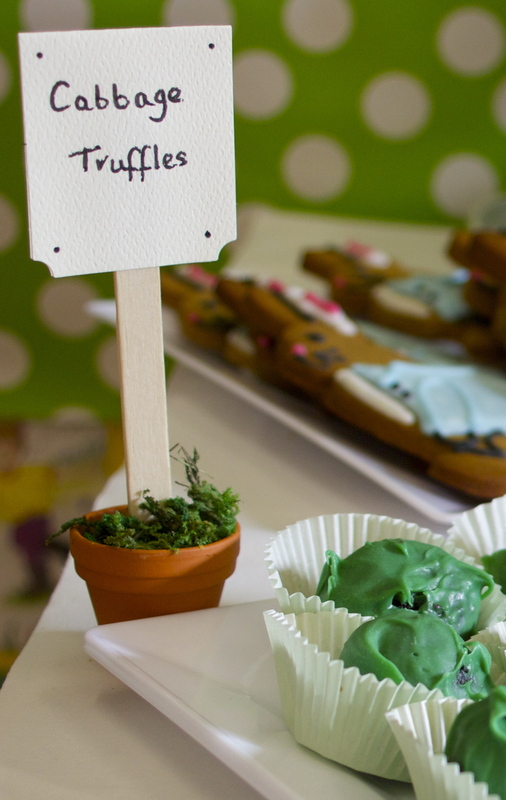 We made food labels using tiny terracotta pots, modelling moss, wooden lollipop sticks and labels – we loved these! 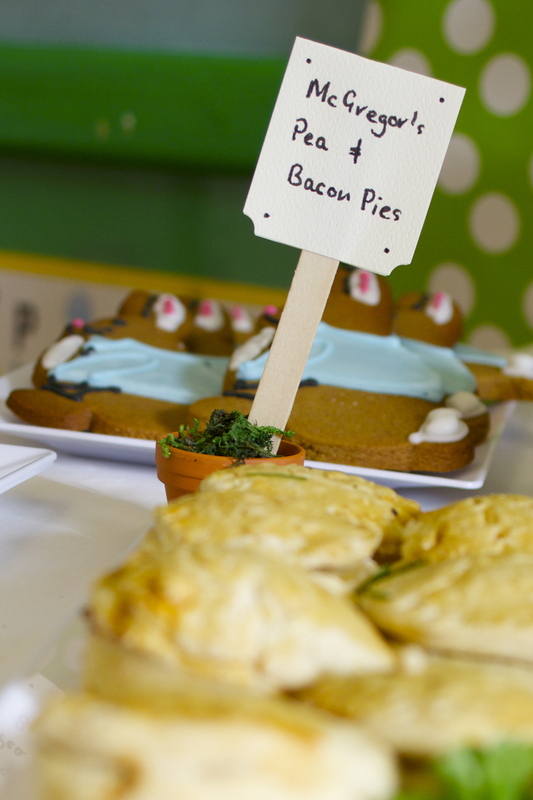 Our sweet treats and cakes were so much fun to make and didn’t stay on the table for long! 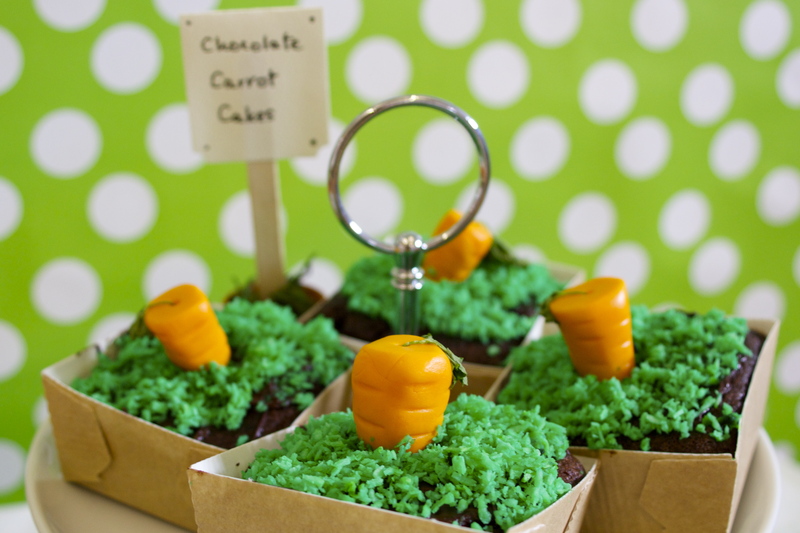 We made Cottontail Cupcakes, Peter Rabbit Cookies, Cabbage ‘Oreo’ Truffles, and Chocolate Carrot Cakes – complete with their own fondant carrot! Fourteen children, an awful lot of running about (us and the kids! 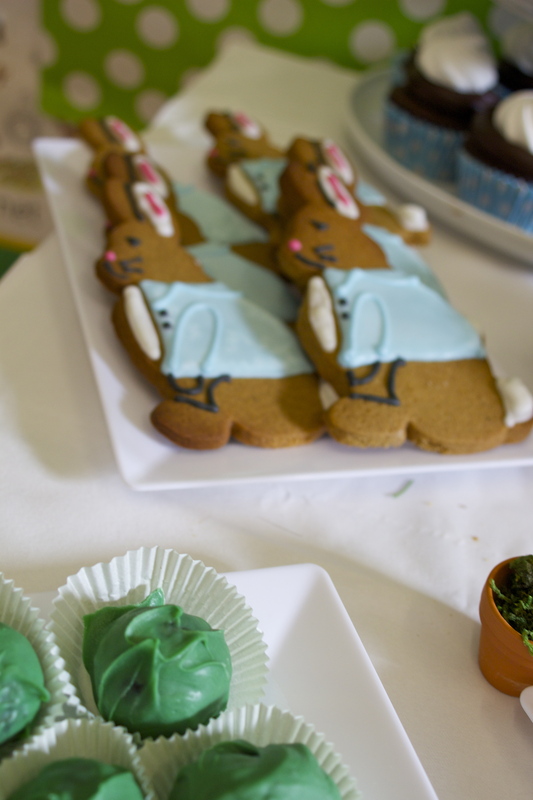 ), bunny party games, and lovely presents, and it’s all over for Lulu for another year. 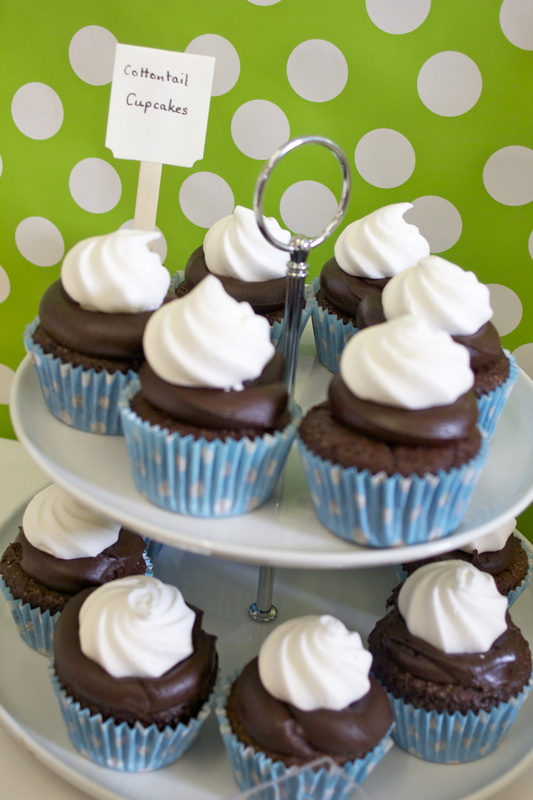 Countdown to Mook’s birthday has now officially begun…. Thanks Joe. 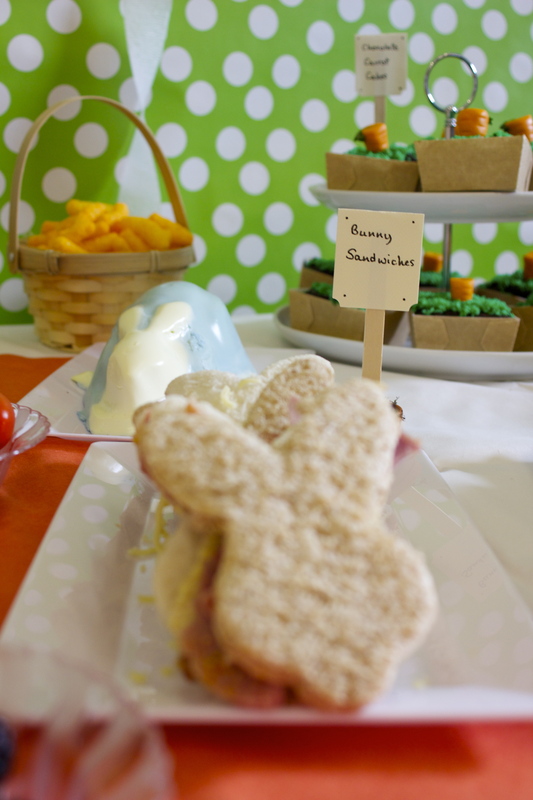 The rabbit jellies are there – complete with coloured jackets, but it seems, sadly, the bunny rolls were a Pinterest swizz! Lovely! 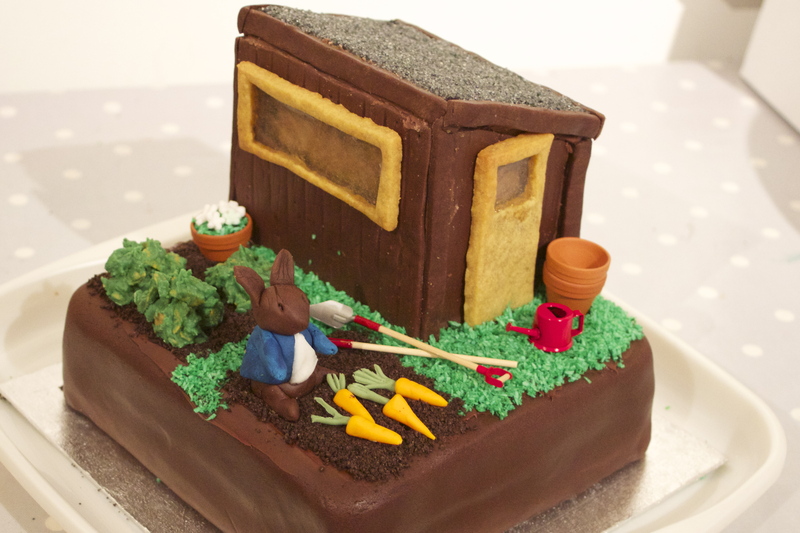 I love Peter Rabbit and even my big tough five year old boy is a (secret) fan 😉 He would love this. I think there’s quite a lot here that would work, even for a big tough five year old!